On a 6-4 vote, the members of the Sarasota County Charter Review Board have agreed on the appointment of a committee to study how best to handle the vetting of proposed amendments to the Charter as a result of citizen petition drives. 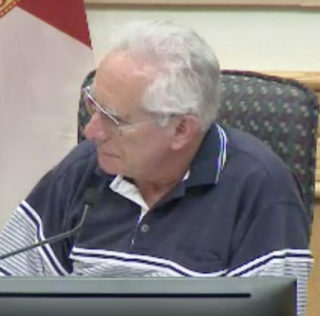 Vice Chair Joe Justice of North Port initially proposed a change to the Charter that would necessitate that any proposed amendment “be fully vetted so all of the pros and cons can be discussed for the public to see,” as he put it in an email to the clerk to the Charter Review Board. However, Justice added that even if the board members felt the amendment would be inappropriate, he believed the person or group seeking the change still could pursue the petition process to put the amendment before voters during a referendum. After a discussion during the Charter Review Board’s Jan. 30 meeting, Chair Anthony Sawyer of Sarasota appointed five of his colleagues to the study committee: James Gabbert of Sarasota, chair; Justice, vice chair; Donna Barcomb of Sarasota; Deborah Lynne LaPinska of Venice; and Neil Rainford of Sarasota. They had joined Sawyer in casting the six votes in favor of the committee’s establishment. Those voting in opposition to the proposal were Richard Dorfman of Sarasota, Pat Wayman of Venice, Joseph Hudgins of Sarasota and David Samuel of Venice. The issue first arose during the Charter Review Board’s meeting on Oct. 17, 2018. At that time, Sawyer pointed out on Jan. 30, he had asked that any members who had comments they wished the full board to discuss should put those in writing. Justice was the only one to do so, Sawyer noted. On Jan. 30, Justice explained that, even with the voters in November 2018 having approved changes to the citizen-initiated Charter amendment petition process, anyone who can gather the necessary number of signatures of registered voters on petitions can get a proposed amendment on the ballot. “I think [a proposed amendment] should come through us to be completely vetted, so both pros and cons … are available to the public,” he said, referring to his November 2018 email. Rainford indicated that he wanted a statement on the record about whether the vetting of proposed amendments is required for any of the methods the Charter allows. Justice then asked Assistant County Attorney Sarah Blackwell, who works with the Charter Review Board, to provide the answer. Blackwell referred to Section 7.1 of the Sarasota County Charter, which outlines the four methods through which an amendment can be pursued. A copy of that section was provided to the board members with their agenda packet, she noted. 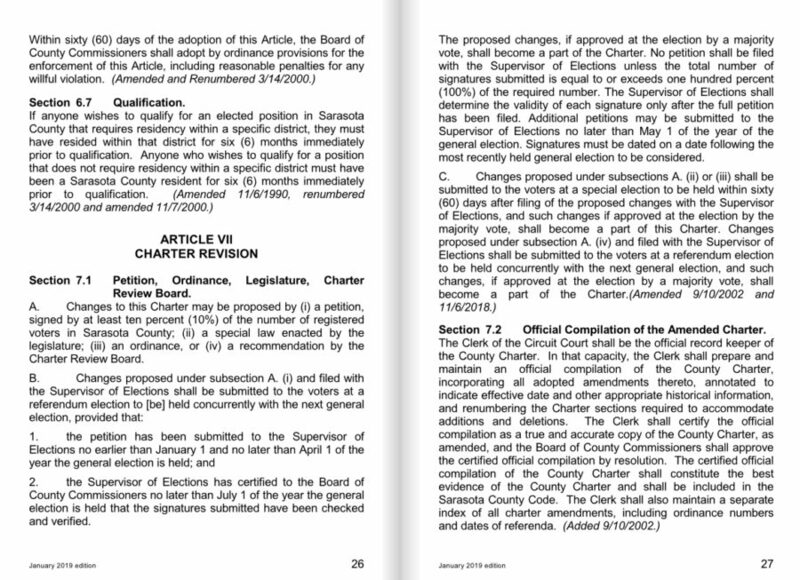 Along with the citizen petition process, the Charter Review Board itself can propose an amendment; the County Commission can propose an amendment; and the Legislature can propose an amendment. After explaining those methods, Blackwell said she believed “a certain amount of vetting” takes place in each process except for one involving citizen-initiated amendments. Sawyer asked each of the board members to offer his or her view on Justice’s proposal. County commissioners last year voiced criticism of the use of paid signature gatherers in efforts to get citizen-initiated amendments on a ballot. For example, she continued, she asked the Sarasota County Supervisor of Elections Office last year to provide her with the number of registered voters in each of the five County Commission districts. She sought the information, she indicated, in the context of the proposed Charter amendment — which passed — calling for single-member districts. The figures she received, Barcomb noted, showed, for example, 57,270 registered voters in District 1 and 73,633 in District 5. The Single-Member District Charter change will allow voters in each district to vote only for County Commission candidates from that district. Previously, all registered voters were able to vote for commission candidates in each district up for election. If voters had had the district voter numbers before the Nov. 6, 2018 General Election, Barcomb said on Jan. 30, “They may or may not have voted differently … I feel we might be the board to be able to at least go through the appropriate vetting,” she added, concurring with Justice. Perhaps the board could allocate some of its budget to running an advertisement prior to an election that could explain facets of any amendments that would be on the ballot, Wayman suggested. LaPinska said she also was opposed to any measure that would lengthen the process for getting a Charter amendment on the ballot, but she agreed that the board should try to educate the public about proposed amendments. Gabbert pointed out that the board could pursue an amendment to the Charter requiring vetting without lengthening the process. “I don’t see how it can’t change the length of the process,” Dorfman responded. “I just believe there’s a way to get the information out” without changing the Charter, he added. Perhaps the group or person who pursues a citizen-initiated amendment process should be required to make a formal presentation to the County Commission, Dorfman added, so issues related to the amendment could be explained fully. Justice said he was thinking perhaps a 15- to 20-minute presentation by the group before the Charter Review Board, so the board could fully vet the proposed amendment. 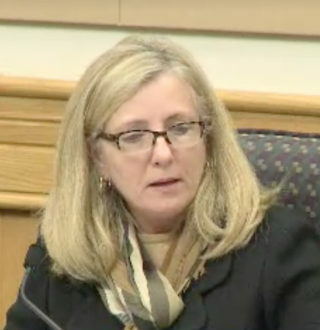 Dorfman suggested, however, that Sawyer seek a vote of the board members on the establishment of the committee. In response to a question, Blackwell, the assistant county attorney, told Sawyer that he had the power to appoint such a committee. Dorfman continued to insist upon a vote, first, to see if enough members supported that plan. Hudgins agreed with Dorfman. After the vote tally showed the result was 6-4 in favor of the committee, Sawyer named the members. 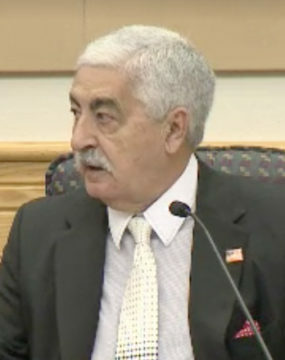 He would leave it to Gabbert, as chair, he added, to work with the clerk to the board, from the Sarasota County Office of the Clerk of Court and County Comptroller, to make the other committee members aware of the meeting dates and locations. Blackwell clarified that the clerk would notify the other committee members of the information.